This article is generally about diving in the Rabaul area of Papua New Guinea but may also be helpful to those planning a non-diving visit. 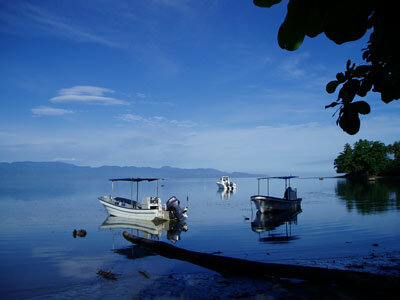 Rabaul is located at the far north-eastern end of the island of New Britain in Papua New Guinea. It is located a the head of Rabaul Harbour (more correctly, Simpson Harbour), one of the largest and most protected harbours in the World. The harbour is actually a flooded volcano caldera. Not only this, the harbour has about seven volcanos surrounding it. There have been many major eruptions over the past 150 years. In 1878 before the town was established, there was an eruption in the middle of the harbour and the volcano now called Vulcan was formed. It is now on the western shore. New Britain was part of German New Guinea and in 1910 the administration moved from what is now called Kokopo to a location that was subsequently renamed Rabaul. At the outbreak of World War I, Australia occupied Rabaul and seized New Guinea. It remained under Australia's administration till after it was amalgamated with Papua to form Papua New Guinea and became independent in 1975. Rabaul was the Capital of New Guinea. In 1937 there was another major eruption when the two volcanos, Tavurvur and Vulcan, exploded destroying the town after and killing 507 people. The capital was then moved to Lae. In January 1942 the Japanese bombed Rabaul and eventually invaded and captured it. After this the Japanese turned Rabaul into a major base, especially for its navy. Once the tide turned for the Allies, Rabaul was by-passed and left under Japanese control till after the end of the war. During this time it was ineffective due to its isolation. After the war Rabaul rebuilt and became the provincial capital. In 1983/4 the volcanoes threatened to erupt but nothing came of it. Then, on 19 September 1994 Tavurvur and Vulcan again erupted. The town was again destroyed, this time by ash falling on buildings and collapsing them. There were little deaths as there was almost a day's warning of the impending disaster. 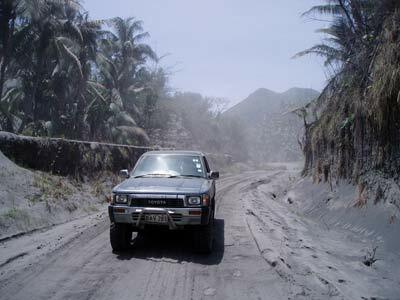 The capital was moved to Kokopo on the southern shore of the harbour after the eruption. The town is now mostly deserted, with layers of ash covering everything. It looks like an atomic bomb has gone off nearby, it is very eerie. 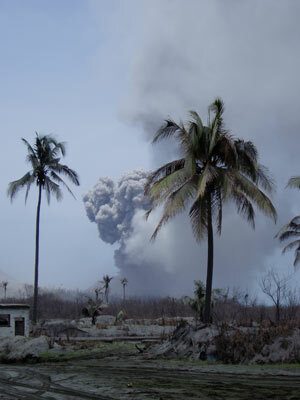 In 2008 Tavurvur is again erupting. It is continually belching out ash and rumbling. 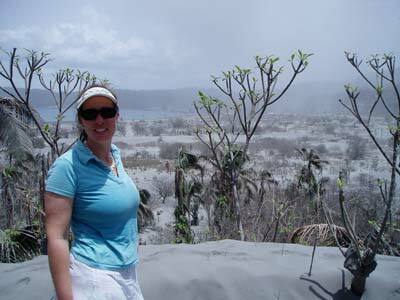 We had ash falling on us when out at sea diving (about 25 kilometres away) and at the resort (40 kilometres). We could even hear the rumbles when underwater about 30 kilometres away and at the resort at night. Coming from Sydney, we flew up from home at 7:30 am on the direct Air Nuigini flight arriving at Port Moresby at 11:20 am. By the way, this was on a Boeing 757 owned by Icelandair and was one of the worst aircraft I have ever flown on. Two of the toilets failed, most of the plane's headsets did not work so the movie was not able to be watched. However, the service was good. We then cleared customs etc and booked our bags onto Rabaul at the International Terminal (finished by 12:15 pm) and then caught the free bus to the Airport Hotel. Here we had lunch and a few beers before catching the bus back to the Domestic Terminal. Over the period till late 2008 the flights to and from Rabaul changed numerous times so what I put here will probably be out of date very quickly. 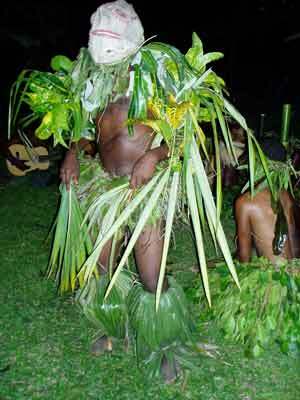 At the moment Air Nuigini flys to and from Rabaul a couple of times each day. They use Fokker F100 twin jet aircraft which are quite comfortable. It is about 80 to 85 minute flying time from Port Moresby. When we did our trip the flight from Port Moresby was on time but there are reports of long delays and cancellations. We left Port Moresby at 2:55 pm and arrived in Rabaul at 4:20 pm. By the time we got all our bags together and on the transport it was about 4:45 pm. This was basically on time. 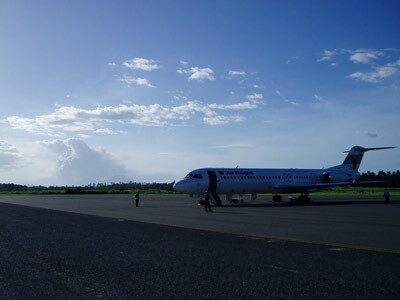 Flights out of Rabaul can sometimes be via other locations such as Kavieng. 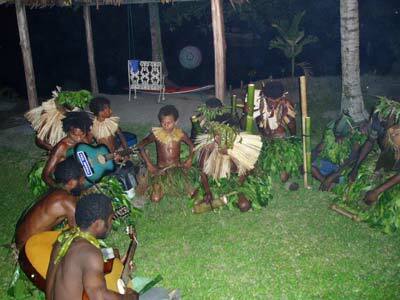 Of course, this also means that you can combine a trip to the Rabaul area with Kavieng very easily. Apparently Airlines of PNG has obtained funding to purchase aircraft that they will be using to set up a far more extensive internal network in 2009 to complement their code sharing international operation with Pacific Blue (Virgin). For diving, there are only two real options. The first is Raporo Resort which is located between the airport and the town of Kokopo (say 10 minutes drive). This looks very nice and is quite large. It is a bit upmarket (as far as you can say this for PNG). 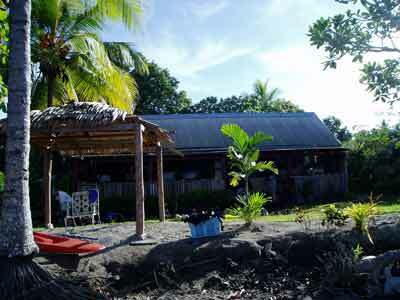 This would be the best place to stay if you want to only dive the wrecks of Rabaul Harbour. The second is Kabaira Resort. 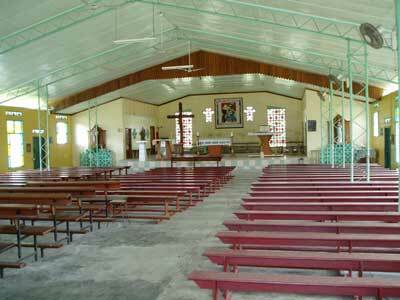 Kabaira is located to the west of Rabaul and it is about an 80 minute drive by mini-bus from the airport. The roads are generally good tarred roads, but there are small sections that are falling apart. It is an interesting journey but it was dark by the time we started getting close to Kabaira. Kabaira is located on the eastern shore of Ataliklikum Bay, just where it turns to the north-west. The resort is owned by Stephen Woolcott whose family have owned the property for over 60 years. Stephen's ancestry is Australian, Papua New Guinean and Japanese. His wife Marsha is a Papua New Guinean. This is more like a bed and breakfast than a real resort. It is right on the beach and the accommodation all is within metres of the water. The accommodation consists of an older plantation style building that has (I think) four rooms each with twin beds. Toilet and showers (hot water) are shared. Stephen has plans to knock this down and build some new accommodation to replace. When we arrived, a sing-sing was performed by some of the locals. This was very interesting, especially for those who have never seen one before. There is also a newer two storey cabin that has a double on the top floor and two single beds on the bottom floor. It also has a living area as well as small kitchen and fridge. It also has a verandah overlooking the water. This is suitable for a couple and children, a couple and close friends or three singles. It has its own toilet and shower (hot water). 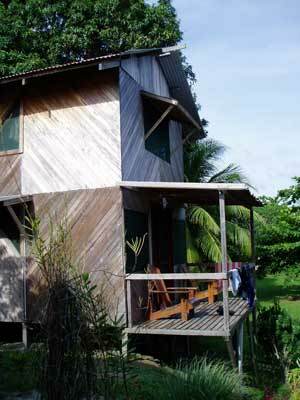 The other building is a single storey cabin that Kelly and I stayed in. This was brand new and we were the first to use it. 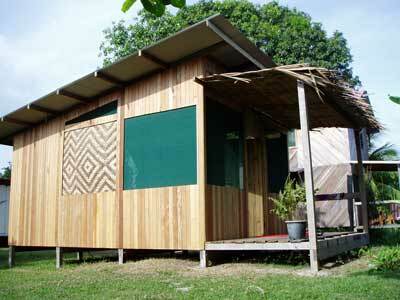 It has a double bed, a verandah and a small living area with table and chairs. It has its own toilet and shower (hot water). It could do with some shelving to put clothes etc but as it was only finished the day before we arrived, this is probably planned. All cabins have fans, either over the bed or on the wall. All also have flyscreens. To be honest, the only time we spent in our cabin was sleeping or setting up cameras. All other time was spent in the dining area. This consists of another old style plantation building that has been modified to include an indoor dining room, semi-outdoor bar and dining area and an uncovered deck area. It is also right in front of the boat boarding area. Some of our group set up their cameras in the dining area after dinner. The power supply is unreliable so the resort has its own generator that is turned on should power fail. There are a number of power points in each cabin, but a small power board should be taken if you are charging multiple things like cameras, strobes and torches. There are a few local dogs and roosters that sometimes can wake you up early, but in general the only sounds heard are the lapping of the water on the shore and the occasional growl of the volcano (which must be 40 kilometres away!). At both accommodations the only option is the resort. I cannot report on Raporo Resort other than they had cold beer at K6 each (about A$3). At Kabaira the food is included in the cost of the accommodation. Each meal is a buffet and for breakfast this consists of wheat-bix, toast, tea/coffee and orange juice as well as hot items that change each day. For example, some days it was bacon and baked beans, other days omelettes etc. For lunch the buffet is varied each day, one day being rissoles, rolls, chips salad (make your own hamburger), another day chiken winglets, rice, sweet potatp, tuna pasta. There was fruit with all meals as well as tea and coffee. Dinner was again a buffet with days including sweet and sour beef, honey prawns, another beef dish and rice, another day spaghetti bolognaise, rice, chicken, fish, pizza. There was dessert each night as well. One night we requested pizza (after a night dive) and a variety of pizzas was provided. A barbecue was dinner one night. All the meals were great. It is not high class cuisine, more like excellent home cooking. I did not hear one complaint from our group of 12 about the food, and I personally am pretty particular about what I eat. The bar has a couple of types of local beer (South Pacific Lager was our preferred beer) at K6, soft drinks at K3 and bottles of water at K4. Cooled boiled water was available free at anytime and each night a jug was provided to take back to your cabin. There are no wine or spirits available, but you are welcome to drink your duty free at the bar. All in all, I can honestly say that this was one of the most relaxed places I have ever stayed, with the friendliness of Stephen and his family and staff making you feel as if you are at home. Nothing was too much of a problem. You even get your clothes washed for free! As mentioned, there are only two options. The first is the operator at Raporo Resort. I cannot personally report on this operation, but two friends from Port Moresby and Sydney used it over Christmas 2007/New Year 2008 and were not all that happy. I have no further details. At Kabaira Resort Steve Woolcott also owns and runs the dive operation (NOTE: Steve later died when overcome by fumes of some sort in a barge - not sure if the dive operation is still operating). He has two Yamaha banana boats. The first one is a bit larger and has a 140 hp Yamaha 4 stroke. The second is powered by a 60 hp Yamaha 2 stoke. This boat carries 6 divers easily with two tanks each. It did about 23 km/h when carrying six divers, two crew and a couple of extra tanks. The larger boat is used when they have say eight divers or carries extra tanks for the second boat. It is easily capable of well over 50 km/h. Steve is attempting to source a larger motor for the smaller boat, but even with 60 hp it is more than fast enough. Each boat has a driver and dive guide. Steve is one guide and his brother-in-law, Lloyd, is the other. Many of the dives are drift dives where the boat follows and collects you wherever you ascend. The seas are normally millpond, many days we had mirror conditions. Steve's Dad, Bert, sometimes helps out when they have other commitments (like fishers). Generally, the dive sites are within 20 to 40 minutes run in the slow boat. Both boats have ladders, water is carried and there is great cake for in between dive snacks. There are shade covers on the boats to provide protection from the sun. Most dives are out for two dives and then return for lunch. The operation can cater for a maximum of 12 divers (both in accommodation and diving). Steve has two small Bauer Junior II compressors (petrol powered) which he uses to fill aluminium tanks. He cannot run electric powered compressors as the power is unreliable. He has a small amount of hire gear. Extra dives cost K270 a double (A$135). You can also do shore dives in front of the resort at K40 and a night shore dive at K60. (these prices have changed late 2008 after I spoke to Stephen and Marsha about changing the pricing to better reflect the true cost of the dive - the shore dive went up and the night dive more than halved). What can I say about the operation? Well, that it was one of the best I have used would be the simple answer. It is relaxed, but runs on time, has great safety as well as being very flexible. The dives are fantastic. Click here to see the whole list of all the dives that we did (there are heaps more). There is nothing I could fault them on apart from the price of the night dive. There are Japanese World War II wrecks, other wrecks and fantastic reef dives. Click here to go to the list of all the dives I did while at Kabaira. After doing the George's Wreck, you are taken via Rabaul. You stop at a number of locations including the Japanese War Memorial (great views of the volcano), the waterfront near the still operating Travelodge Hotel, through the ruins of the town (like a post-apocalyptic city) via small section of town still operating to your next dive site. After a dive or on your free day you can walk to the local village where there is a nice church (Catholic St Huberts) and school as well as a small shop. The locals are very friendly and the kids curious. Kelly and I took some pencils and small koalas and gave them away to the kids as we walked up the road. There was more joy from these kids than if we gave an X-box to an Aussie kid. As well as the excellent diving in front of the resort, you can snorkel here and further up the coast. You can also borrow for free a canoe. On your last day when being transferred back to the airport, Steve will stop off at a lookout that gives great views over Rabaul and the harbour as well as at Kokopo markets (soon to move to almost completed new premises) as well as a local supermarket. You can get cheap local bags, woven plates and T-shirts here. This was one of the best diving holidays I have ever had. Well recommended.